New Illinois-Chicago coach Steve McClain discusses the Flames, Indiana and recruiting in basketball hotbed Chicago. CHICAGO — The phone rang and Illinois-Chicago athletic director Jim Schmidt was on the other end, wanting to talk about its vacant men’s basketball coaching position. Steve McClain stopped watching film in the Indiana basketball offices and answered, and then he listened, and then he walked down the hall to debrief his boss and maybe get some advice. He got a blessing, and an endorsement he didn’t anticipate. On a brisk walk from the basketball offices to lunch on the near west side of this city, the charged-up, 52-year-old McClain spun that yarn to underscore the potential of a program that hasn’t made the NCAA tournament since 2004 and won just 39 games over the previous four seasons. Upon close inspection, there is reason for optimism. The Flames’ on-campus arena isn’t a palace, but it’s as good or better than what plenty of its peer schools offer. Its practice facility is bright and spacious and was worthy enough for recent NBA draft combine attendees to use for workouts. It’s a city school, for sure, lacking acres of tree-lined quads. But McClain leads his visitor to lunch in a freshly redeveloped block or two of restaurants steps from his office, and a 10-minute ride would take you into the heart of downtown Chicago. It’s folly to deem UIC some sort of sleeping giant. It’s fair to say its strong suits have gone underexploited for a long time. But there is no danger that McClain will miss out on the school’s advantages. He threw out the first pitch at a recent Cubs game, made the back page of the Chicago Sun-Times and laid that out for a visiting recruit to see. McClain, who had been an Indiana assistant for the past five seasons, is eight years removed from his last head coaching job at Wyoming, where he went 157-115 from 1998-2007 and made one NCAA touranment, so there is an urgency here. McClain was hired by Illinois-Chicago on March 23, and he sat with SI.com in mid-May to discuss his vision for getting this one right, when others haven’t managed that in more than a decade. SI: At this time in your career, given where you were working, why was this the right place for you when they called? McClain: From (the time I talked to Crean) on, I had a great feeling about it. Then it just kept growing because of Jim Schmidt, the athletic director, and our new chancellor and what his vision was, as we started talking about the job. SI: What did you know about UIC? How much did you have to learn quickly before you decided to come aboard? ​McClain: Whenever you walk in and they’ve been losing, there has to be a reason. My thing was to come in, evaluate it and say, ‘What do we have to change in how we’re doing our business?’ What I saw was, this whole university has taken a change in the last five years. The whole part of this city has taken a change in the last five years. My thing was, now we’ve got to make sure people are getting on this campus. As we were recruiting and I’m trying to get young men and their families back on this campus, once I got them here, they saw a whole different world. As I looked at it, I went, we’ve got a great facility. Is it 20 years old? Yeah, it is. But it’s 7,000 seats. It’s right on our campus. We’ve got a great practice facility. We’ve got good offices. Great academics. I take that as a positive. We’re going to sell, this degree means something for you down the road. SI: How much were you champing at the bit to run another program? Did it have to be the “right” place? McClain: I had turned other jobs down. There isn’t any question that Indiana is considered one of the top 10 programs in the country. And I was working for a guy that was my boss but also was one of my best friends. And my family loved it. And coach Crean’s family and my family are very close. No, it had to be the right fit for me. Was I champing at the bit? Yeah, I was. But it had to be the right fit for my personality, for what I believe you have to do to win, and for my family to be happy. 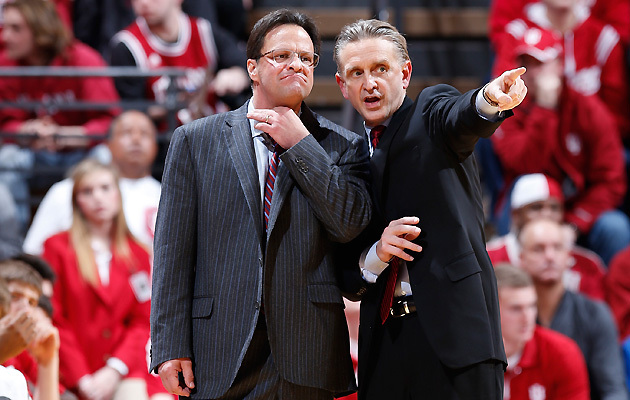 SI: Good, bad or indifferent—what did you learn from being at Indiana? McClain: In a good way, I missed the first two years Tom was there and kind of walked in in the third year of the rebuilding program. It confirmed what I knew, that when you have to build a program, whether it’s Indiana or UIC, it starts with the people who you hire. And two, the character of the guys you recruit is going to take the culture back where Indiana wanted it, where we want it at UIC. Being there and helping Tom reaffirmed what I already knew. SI: So what did you have to change walking in the door at UIC? SI: What’s the dress code? McClain: Well, just walk in and be a presentable student. I want professors to look at my players as student-athletes. I don’t ever want one of my kids to walk into a class and have a professor go, “That’s one of the basketball players.” I want them to look at my guys like, that’s a first-class organization. Because we’ve got to sell everything. We’ve got to get people to come to games. As I told my team, you’re recruiting every day when you go to class, when you’re in the cafeteria, when you’re around your professors. If they feel good about you, they’ll come watch us play to help us win. SI: Basketball-wise, what’s been the conditioning/training plan early on? McClain: We’ve hired a new strength coach. I did get three weeks with the six guys that will be returning, and they’re all going to play a key role, so it was important to get those three weeks. Giving them an idea of how hard, how fast, how detailed we were going to be. Any time you walk into a program, your first summer can set the tone for the next five years. SI: What do you mean by working out “fast”? McClain: We’re never going to waste any time. We’re not going to take 10 minutes to warm up. We’re going to warm up in five minutes. My thing is, the game is a reaction game. The game is a game of footwork, a game of details. But can you do it at a chaotic pace? Because when the ball tips, it’s chaotic. If you don’t practice that way, then when the game becomes chaotic, you can’t deal with it. I want them to work at a pace that the game actually seems slow to them as it unfolds. SI: How do you feel you’re going to play? Is there a way you need to play in this kind of market? McClain: We better entertain. Because we’re fighting with the Bulls, the Blackhawks, pro baseball, pro football. We’ve got to put a product out there that is fun to come watch. Now, winning is fun. So when people stay “style of play,” we’re going to play however we have to play to win. But in the ideal world, we’re going to play fast and create a tempo. SI: What is the approach recruiting Chicago and the state of Illinois, and mining the talent in your backyard? ​McClain: My second day on the job, after the press conference, I hit 12 schools. Within four days we’d been in 48 schools. We attacked it right off the start. I made sure I was touching coaches and made sure they knew it was a new day and age at UIC. In the state of Illinois, there are enough players to get where we want to get. It’s proven every year, because I’m watching them play in the NCAA tournament. Now they have to put on a Flames jersey and play in the NCAA tournament. SI: What was the reception from those coaches? McClain: It was great—for 20 years I’ve been coming in here and recruiting. Most of them I had a relationship with, so they’d have been surprised if I wouldn’t have been there the first day. I think this: In any state, the high school coaches would always love to see their kids stay and play where they can come watch them play. Now, the kids that are being recruited at the highest level? They’re going to go wherever they want. When you’re being a recruited at a level that the top five programs in the country are recruiting you, you may leave. We’ve got to keep the kids at home that are leaving to go to Wichita State, or Gonzaga. That’s the kid we have to keep at home. SI: If everything goes to plan, where do you set the bar for the program? McClain: I’ll give you my Billy Tubbs line—when we went to TCU, he said, ‘Steve, we want to be in one league.’ I said, ‘what league is that?’ He said, ‘it’s the top 25.’ When you’re in that league, it means you’ve done everything right. I may be dreaming big, but that’s what I want to get this program to, is an expectation of a Butler during their era of the Horizon League. Wichita State in the Missouri Valley. Gonzaga in their league. Where every year, it’s expected that we’ll be a 20-win team, that we’ll compete for a league championship, and that we’ll be a team talked about for the NCAA tournament. I believe all those things are realistic at UIC. Because they have been done here in the past.